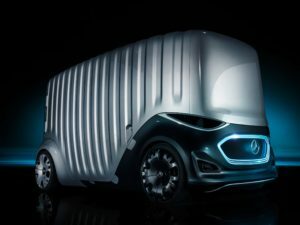 Mercedes-Benz will use next week’s IAA Commercial Vehicle Show to showcase its vision of future urban transport, which can transform into a van, minibus or pallet truck. The fully-autonomous ‘Urbanetic’ mobility concept “goes way beyond existing ideas on autonomous vehicles”, says the company, and will eliminate the separation between goods transport and people moving. The concept uses a self-driving, electrically powered skateboard-style chassis that can accept different bodies, either as a roomy ride sharing vehicle or goods transporter. As a ride-sharing vehicle, Vision Urbanetic can accommodate up to twelve passengers, while the cargo module can carry up to ten EPAL pallets. A load space 3.7m long fits into a total vehicle length of 5.14m. The autonomous chassis to which the bodies are attached incorporates all the hardware required for the driverless features to function, allowing the Urbanetic to travel to locations without a body attached. The new concept also showcases an IT infrastructure that analyses in real time the supply and demand of either ride-hailing passengers or goods within a defined delivery area. Mercedes-Benz Vans says it envisages transporting more people and goods with fewer vehicles on a virtually unchanged roads infrastructure.